It was announced in the Winter edition of Bluebell News that we now plan to extract the rubbish from the tip by train, 1000 tons per day, each train saving 50 lorry movements. 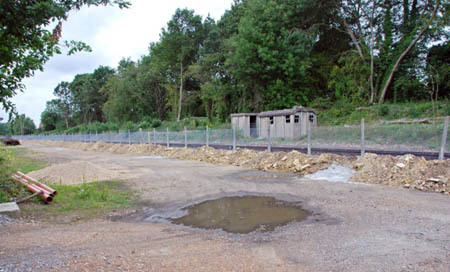 We will be starting this later in the spring, once we have laid track down from East Grinstead to the north end of the tip, initally as a 1-week trial to prove the feasibility and costings. Removal in this manner has numerous advantages. Quite apart from the obvious one of taking lorries off the roads, it requires much less infrastructure on site at Imberhorne, so enabling an operation that can economically be switched on and off as the money is available. 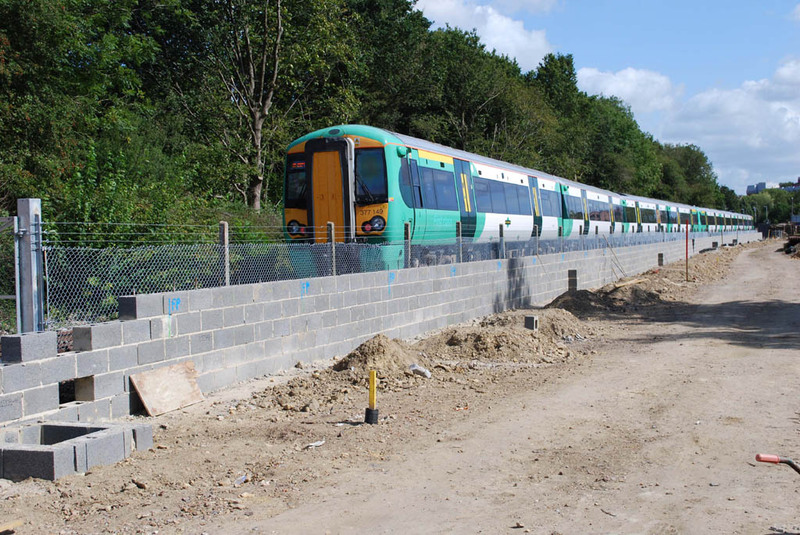 It will also be cheaper, thus enabling us to reach East Grinstead sooner. But we still need your donations and contributions to fund the removal! 1 October 2009: Laying down and levelling sand on the viaduct before the membrane is laid, and the side of the viaduct which will carry the track, ready for the membrane. 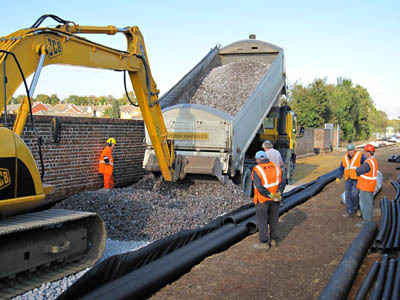 15 October 2009: Positioning the rolls of membrane, a heavy job done with the help of the digger, and a delivery of ballast being carefully levelled. 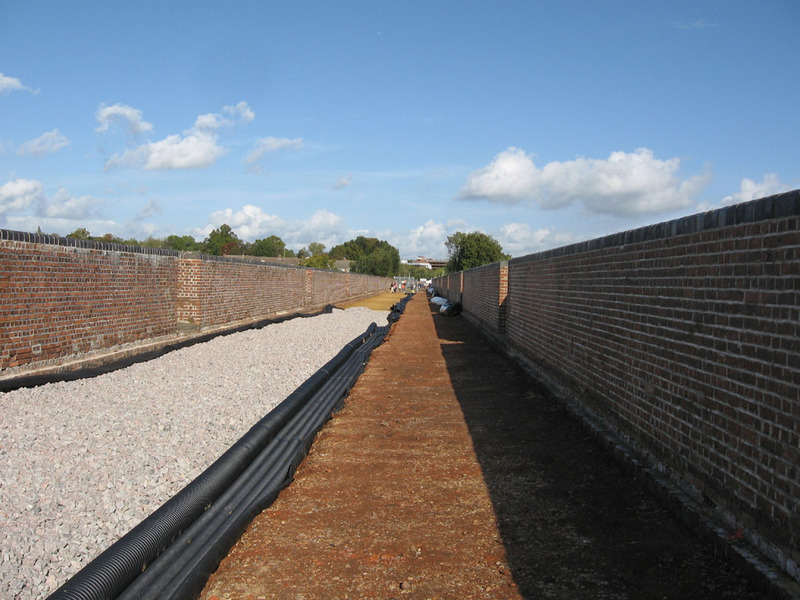 21 October 2009: The sand has been levelled on the access road and drainage and duct pipes are in position. The	original crushed brick scrapings from viaduct are seen being put back on top of the membrane in the access road. 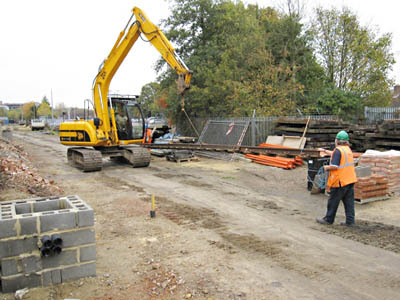 28 October 2009: Tidying up the station site ready for a load of rail to be delivered - a	heavy job for the digger, but within it's load limit. 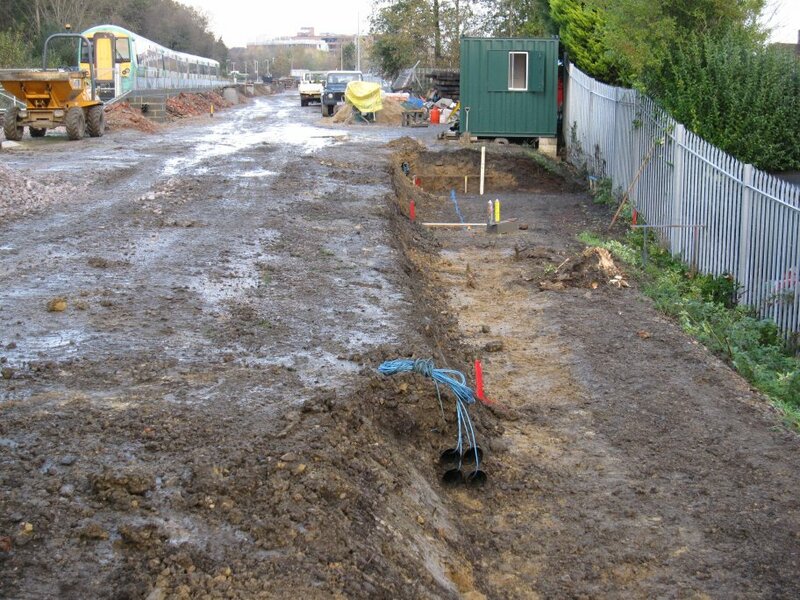 11 November 2009: Foundation trench dug ready for the relay cabinet slab. Most of the drainage pipes and ducting have now been covered - access chambers are being formed at duct junctions, for wall lighting and signalling cables. 18 November 2009: Some very expensive glue is needed to stick the two membrane sheets together! 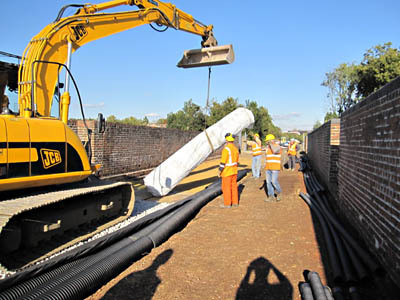 The main drainage pipe is wrapped and ready to cover with ballast. The smaller tubes are the ducting. 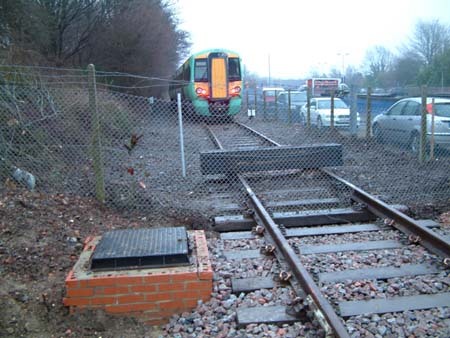 23 November 2009: This access chamber unfortunately now has to be moved before Network Rail come to slew their track across 9 inches. 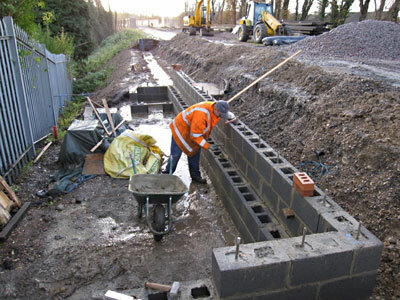 Construction of the retaining wall for the relay cabinet slab is well under way despite the atrocious weather conditions! 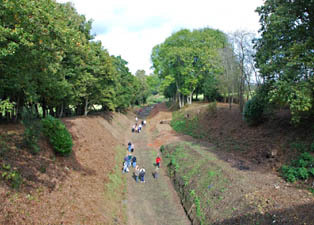 December 2009: Nearly there! The last few feet of ducting before the end of the viaduct are covered. 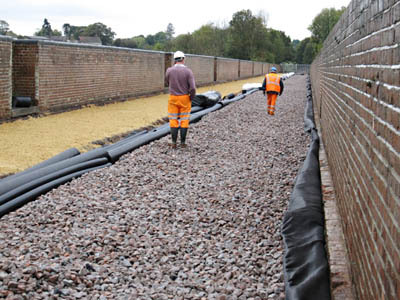 The first ballast laid beyond the viaduct, with the trenching for cable ducts being dug as far as the cattle creep. The weekend was a great success, with so many people arriving on the Saturday morning that there were queues to buy admission tickets. These photos provide a flavour of what was on show. Over 1300 people attended the event. The photos above are from David Middleton, showing the north face of the rubish tip, and the viaduct with drainage and ballast going in. Derek Hayward's photo from Hill Place Farm Bridge, shows some of the visitors walking up the trackbed between the viaduct and the tip. 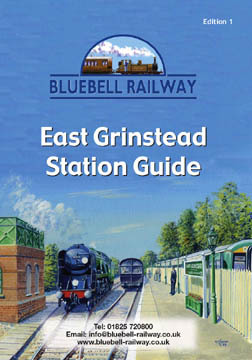 As part of the event we launched our guide to East Grinstead Station, a booklet which details the history of the original station, our own progress to date and our future plans. This is available from the Sales and Information office at Sheffield Park for £2.50. Prints of the painting (used on the cover of the booklet, right) by Matthew Cousins, showing our planned platform and water tower at East Grinstead, are available to anyone making a donation of £50 or more to the fund to build the water tower - phone the Sales and Information office on 01825 720800. 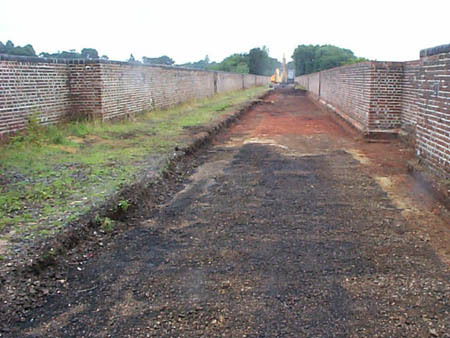 The first photo below (all are from, and copyright by, Derek Hayward) shows the scrapings from the viaduct stored alongside the trackbed, for later re-use as platform in-fill. 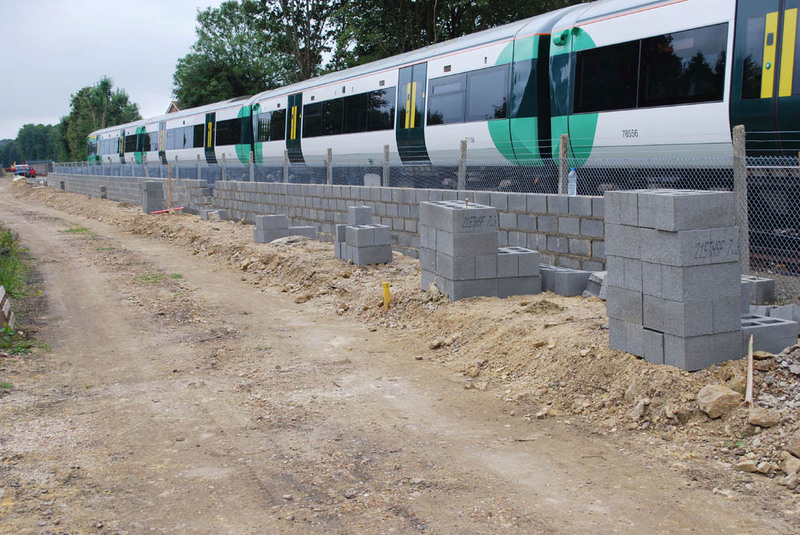 The second photo shows the progress with building the platform, with the blockwork back wall complete and awaiting capping, and the construction of the brickwork front wall. The final photo shows the point which separates Bluebell running tracks from our Network Rail connection, with the start of the track into the platform on the right. 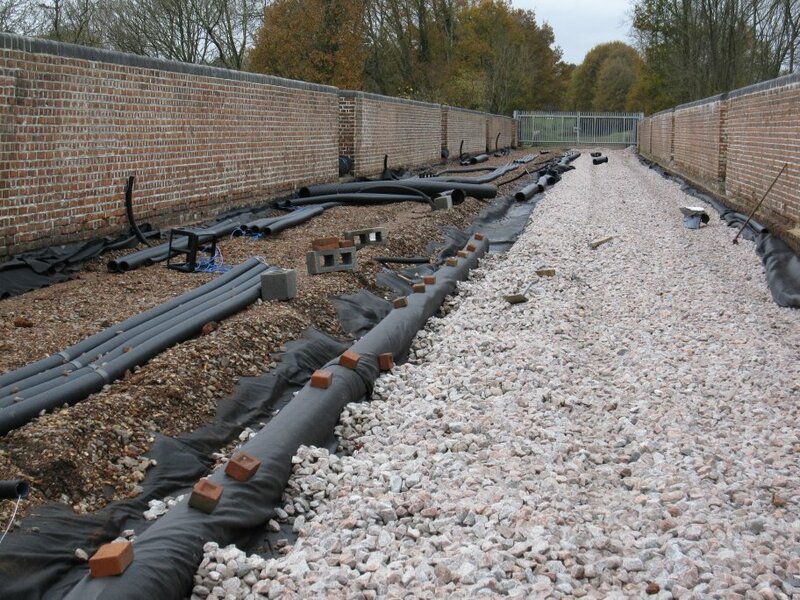 The pipes stored on the track are for use in the drainage and rainwater harvesting scheme which will supply the water tower on the station site, via a sump and storage tank beneath the tower. 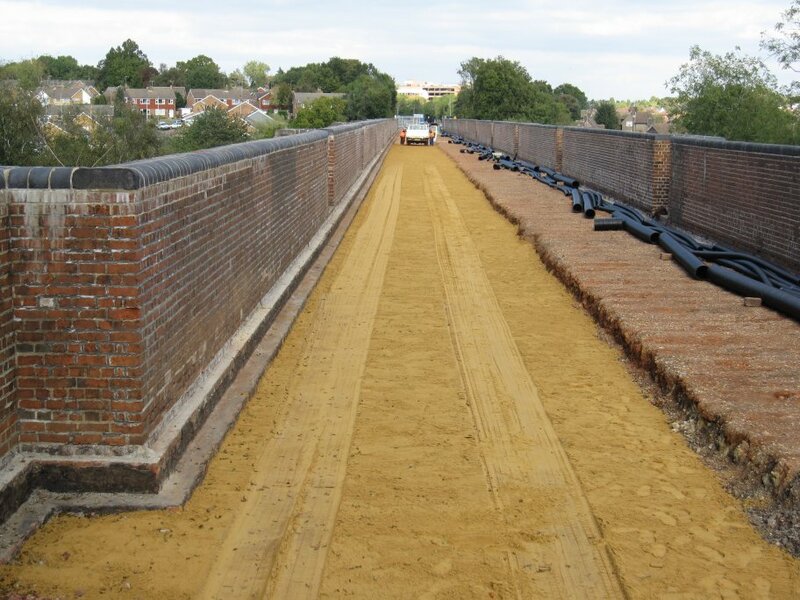 Recent work has concentrated on preparing the viaduct for installation of a new waterproof membrane. 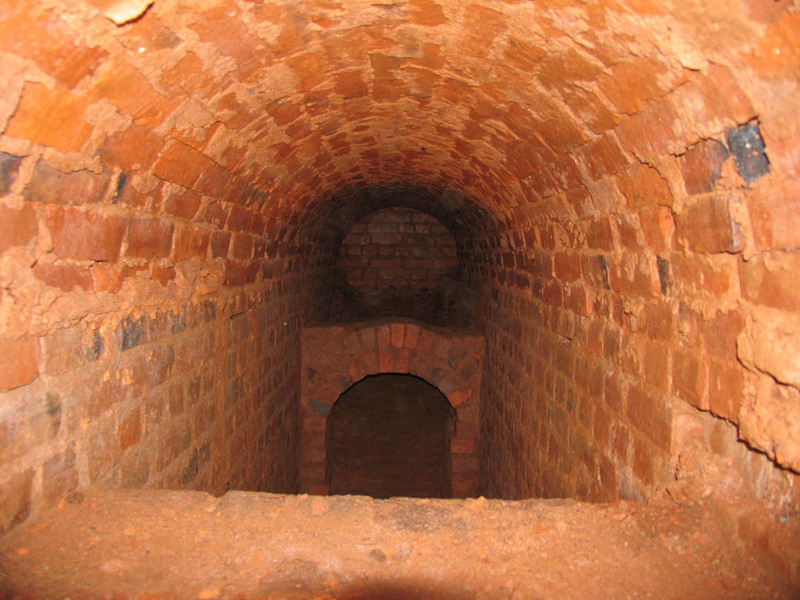 The viaduct piers contain a chamber that was part of the original drainage system and these were accessed from ballast level by means of a brick tower (photo 1). 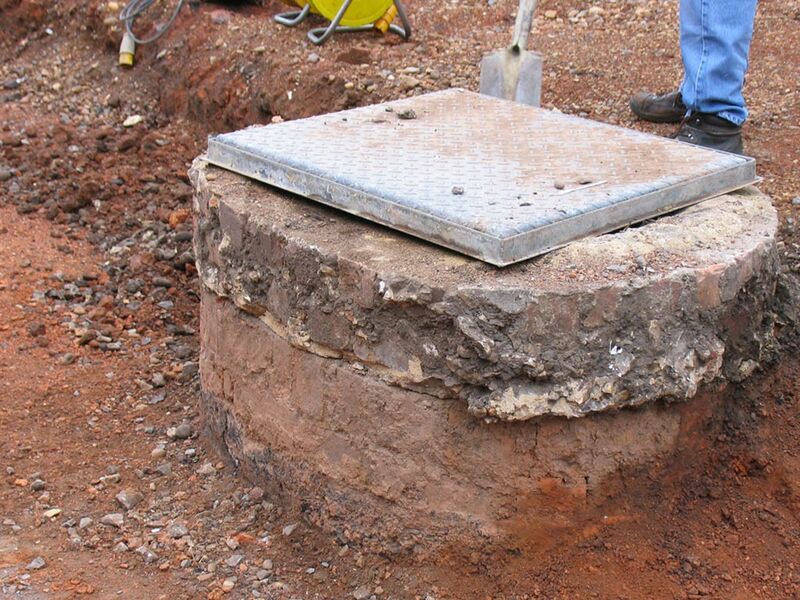 To enable the new drainage system to be installed these towers have been lowered and capped. 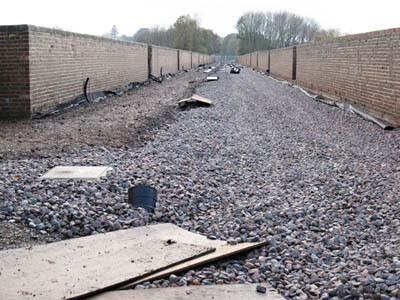 Prior to capping the chambers have been emptied of material that has fallen down from track level and has included ballast, pieces of the original York stone covers, sleepers and other general rubbish. 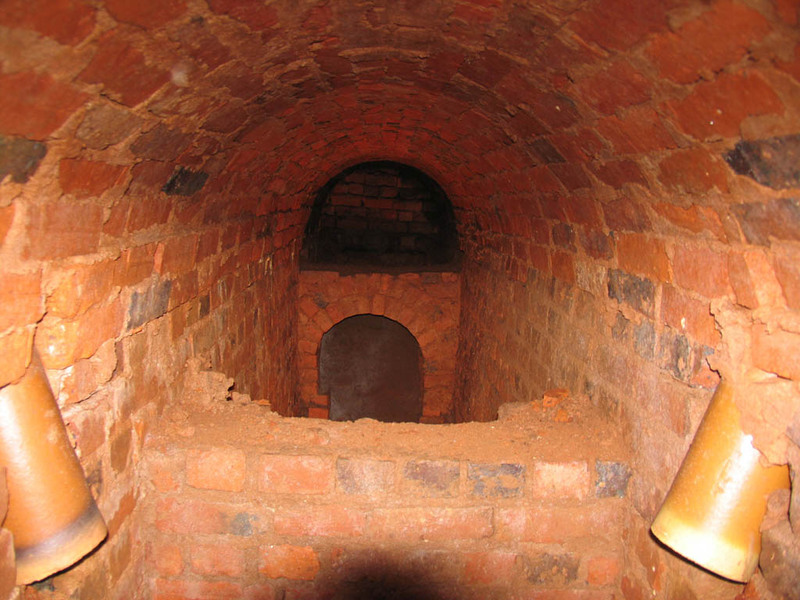 This clearance work has offered a last opportunity to photograph the chambers before the new cap is cemented in place. The chambers are an interesting example of Victorian engineering. 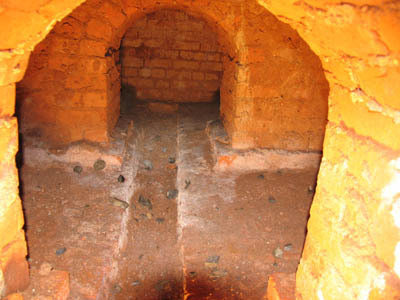 The chamber opens out into voids running across the length of the viaduct (photo 2) until the upper surface of the arch is reached and across the width (photo 3) to the outside walls. The original drainage system ran from the upper surface of the viaduct (from the ballast) through clay pipes into the chamber (photo 4) . 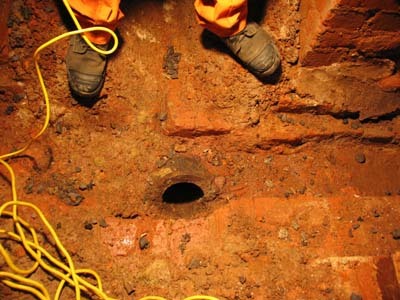 The water then drained out of the side of the piers through cast iron pipes (photo 5). Another two photos from Patrick Plane show the state of play as of Friday 21st. The platform back wall is well on the way to being built - the traditional brick front wall will come later. 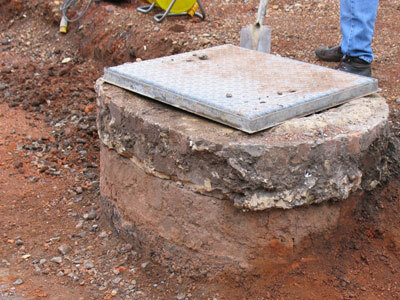 The rather tedious job of filling the voids in the blocks with concrete and strengthening rods is in hand. 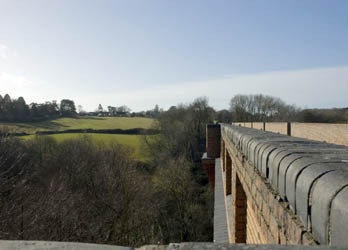 The fill on the viaduct has now been removed. 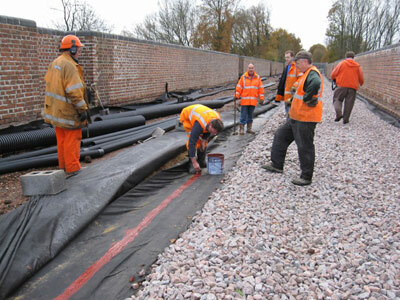 Further work is required before the waterproof membrane is installed. These photos from Patrick Plane show progress during the first week of work, with the blockwork of the platform back wall now over four coach-lengths long, and 50% of the necessary fill removed from the top of the viaduct. 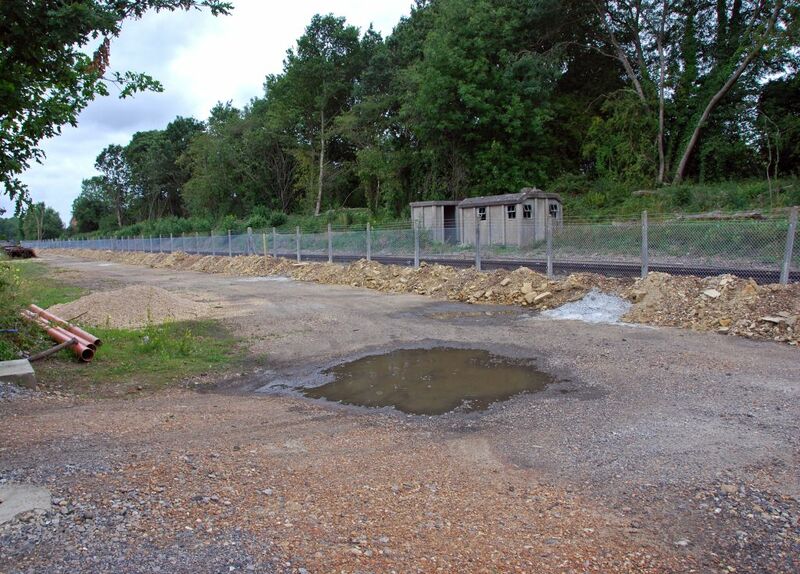 Whilst we have funding in place for the work we are currently doing at East Grinstead, don't forget that we still need to raise £3.5 Million to remove the remaining 90,000 tons of waste from the tip - Donate to the 50th Anniversary Appeal and help us complete the extension. 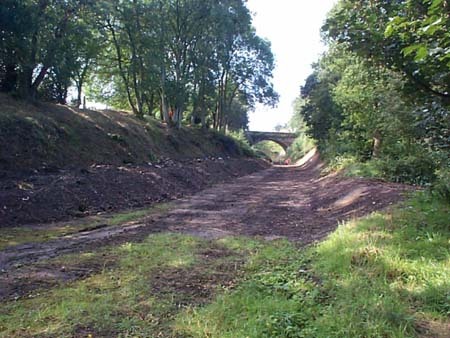 On Monday 10th August 2009 two important phases of the Northern Extension Project were started (as seen in Nigel Longdon's photos, taken that day). The back wall of the station platform is being built in blocks. 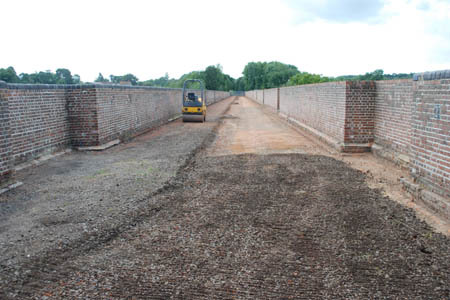 Later the front wall will be built in traditional brick. 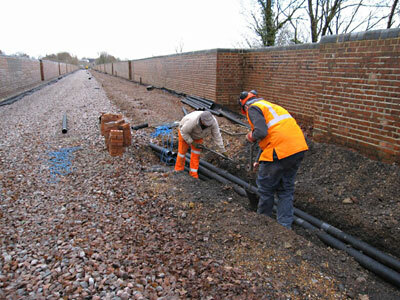 The remedial work on the viaduct drainage system also started. This entails scraping off the top layer of old ballast and fill to a level profile. 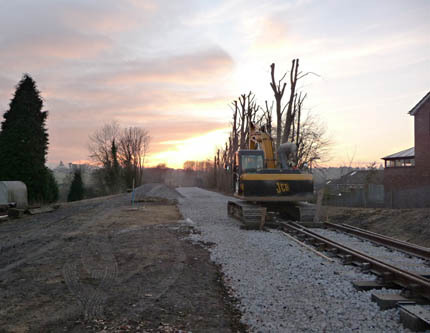 The west ("up") side where the track will eventually be laid is being cleared first; the east side will follow. When these have been prepared a new waterproof membrane and porous drainage pipe will be laid. on the weekend of Saturday 10th and Sunday 11th October. 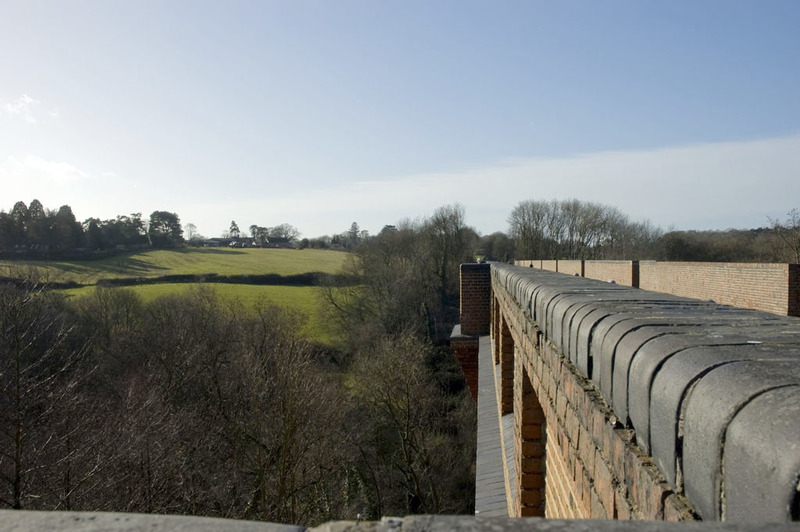 The site will be open from 10.30am to 4pm each day and will allow the opportunity of viewing the construction of our new platform and the completion of the work on Imberhorne viaduct. 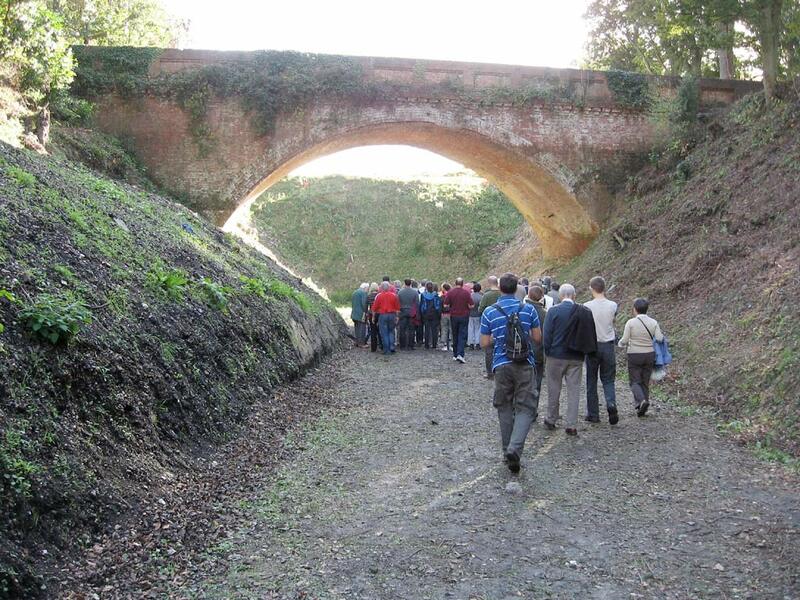 There will be the opportunity to walk across the viaduct and conducted tours along part of the old trackbed towards the tip. 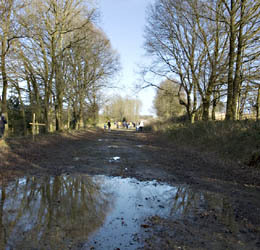 In view of the recent rain, you would be well are advised to wear appropriate shoes or boots. We will have a special display showing what is involved in rebuilding the railway back to East Grinstead with an opportunity to meet and talk to those involved in the line's reconstruction. 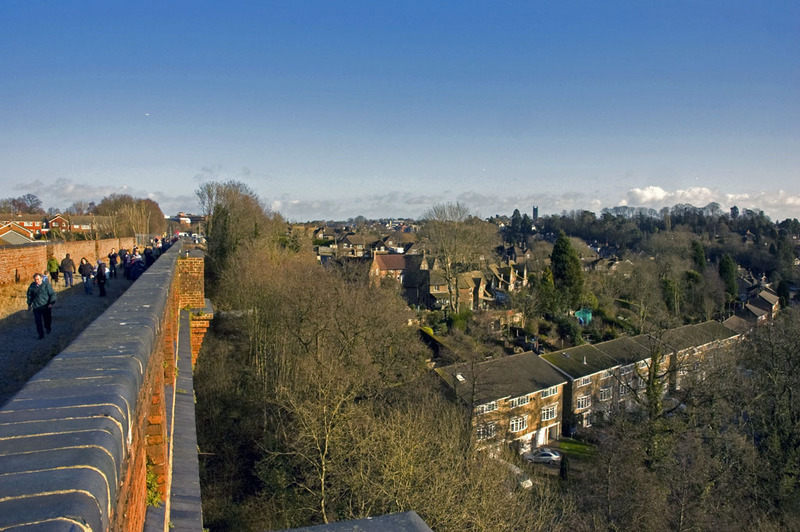 Car parking facilities are available in the local town car parks or travel by train from London Victoria, Clapham Junction, East Croydon to East Grinstead. Even better though is to travel to East Grinstead by parking at Sheffield Park or Horsted Keynes stations and taking the steam train to Kingscote and the connecting 473 bus to East Grinstead. (Discounted tickets available if purchased up to 8 days in advance). 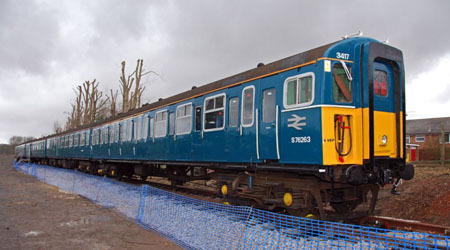 On each of these days a special earlier train service will depart Horsted Keynes at 10.25 with connecting bus to East Grinstead. Trade stand enquiries - please email Tracy (dot) Cowley (at) bluebell-railway (dot) co (dot) uk for details. During the past week (commencing 3rd August) the trackbed in the cutting immediately to the north of Hill Place bridge was tidied, as seen in this photo. 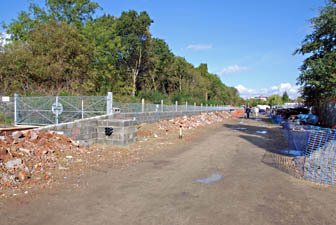 Spoil has been moved to the east side which means that the trackbed from East Grinstead station site to the north end of the tip is now clear and level for track to be laid. Commencing today, the building of the East Grinstead platform back wall will be started, as will the remedial work to the drainage system on the viaduct. There will be a lot of progress north of the tip in the coming months. 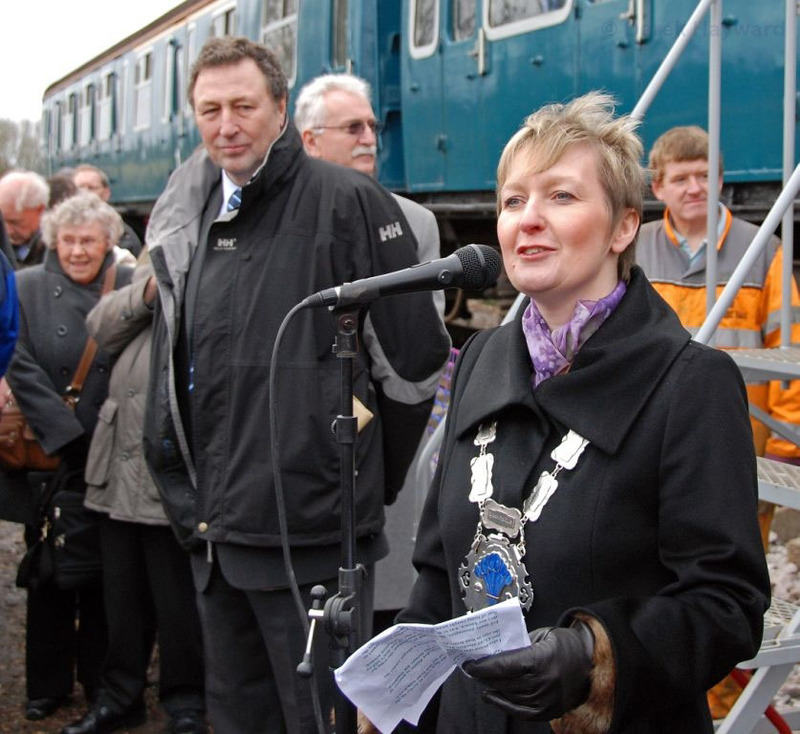 Last Friday the Railway launched its 50th Anniversary Appeal - a new web site specifically for the appeal explains what the aims are, and a large part is to raise the funds needed to complete the extension. Please make a donation to help us to achieve those aims! It's a while since the last update, however the project has certainly not stood still. 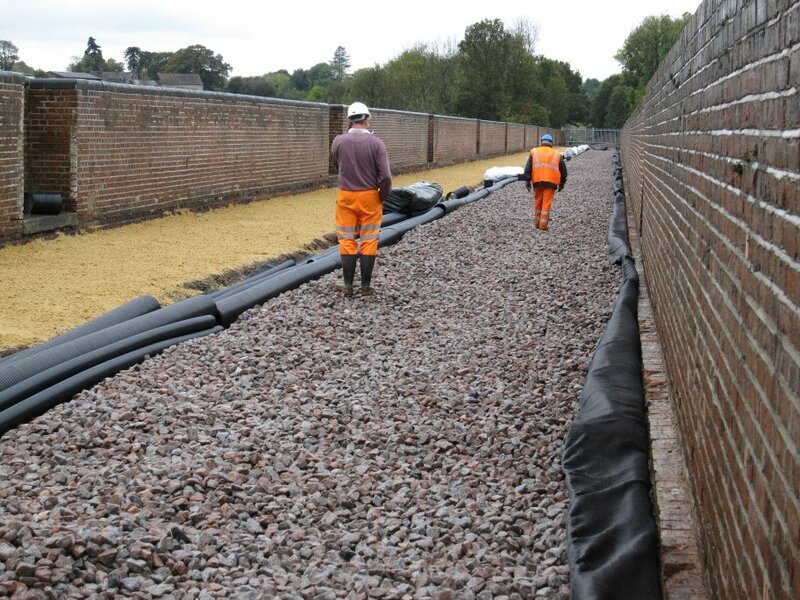 At Imberhorne Lane catch pits have been constructed to take the run-off from the road in a controlled manner down to our drain. Attention then turned to the East Grinstead station site where pipes have been laid for the services: water, sewage and electricity, and a permanent messing facility installed. 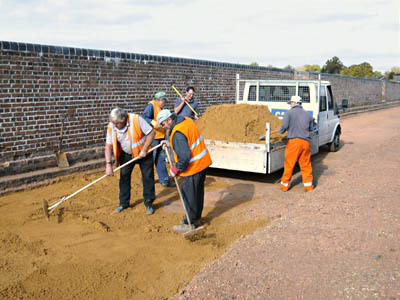 This has been a slow process as the ground is hard sandstone and unfortunately the fruits of our labours cannot be seen. 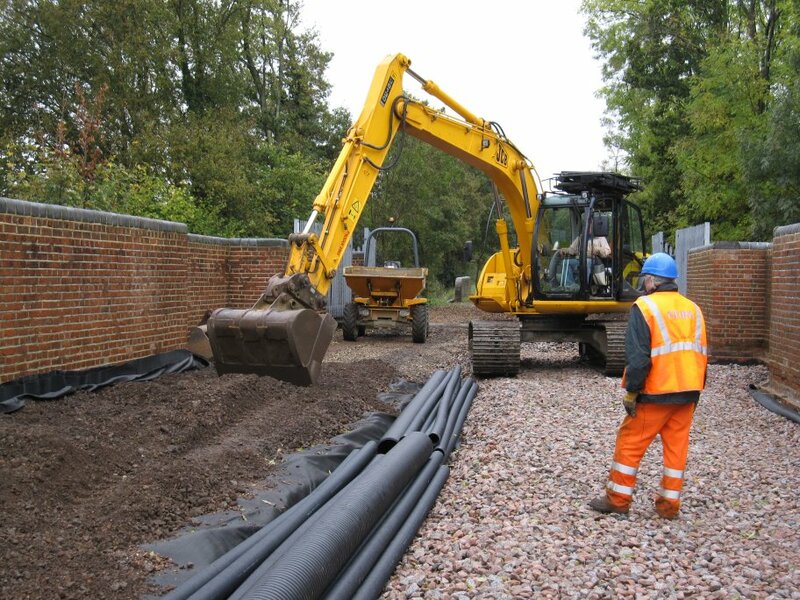 The sewer is complete and whilst we do have a water supply but are waiting for a larger supply to be provided by the water authority. An electricity supply will follow. A start is now being made on the footings (as seen in Derek Hayward's photo) for the back wall of the platform which will be formed of block work (the front will be of traditional brick). 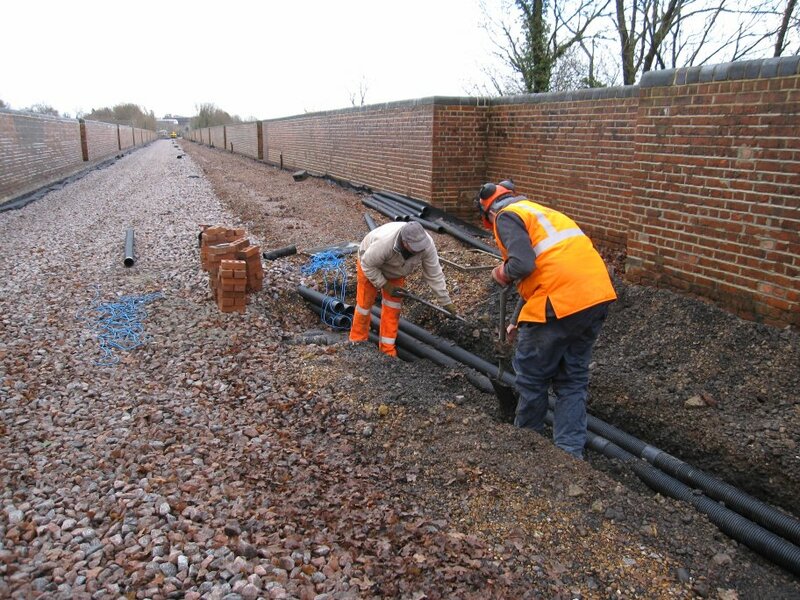 Shortly work will commence to replace the drainage system on the viaduct. 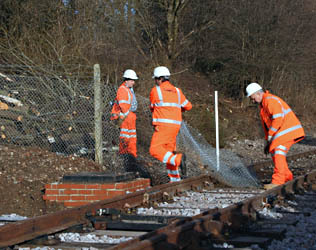 Meanwhile the Saturday Gang have continued to tidy the lineside from Imberhorne Lane towards Kingscote. 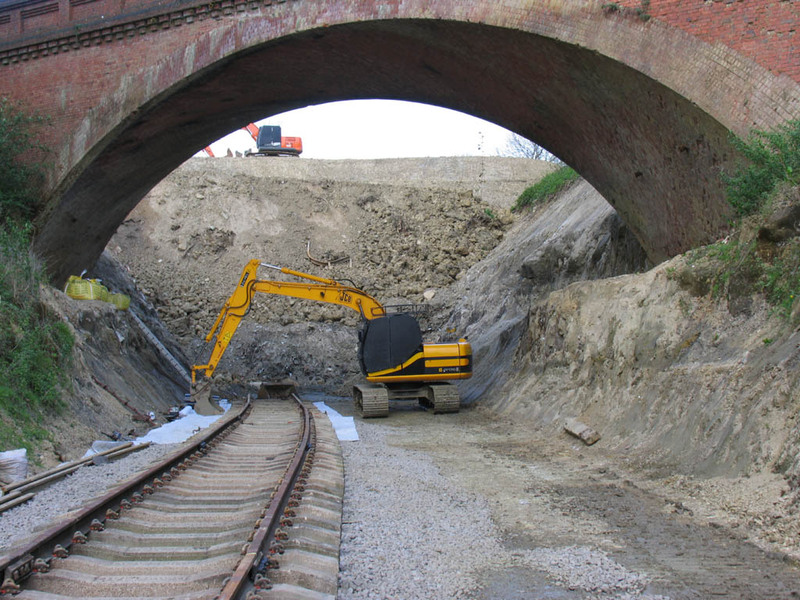 This has been completed and attention is now turning to the section between the viaduct and tip. Progress with fundraising continues. Approaching £35k has been raised by Tenner for the Tip; our visitors have been very supportive in this respect. 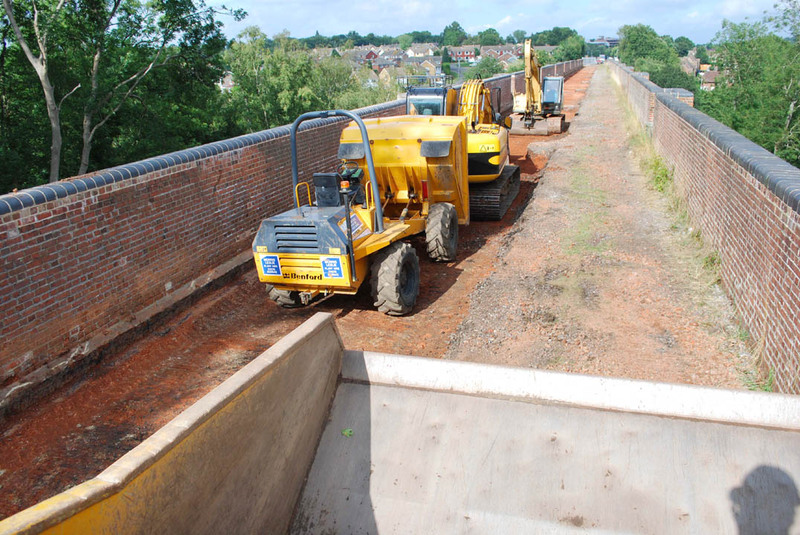 The extraction of spoil from the north side of Imberhorne Lane bridge is almost complete. In excess of 10,000 tonnes will have been removed to the triangle at Horsted Keynes where it is being profiled for use as a picnic area with access to a small nature reserve. The use of the Class 73 Electro-Diesel has proved to be the right tool for the job as it can travel at line speed without delay to scheduled passenger trains. 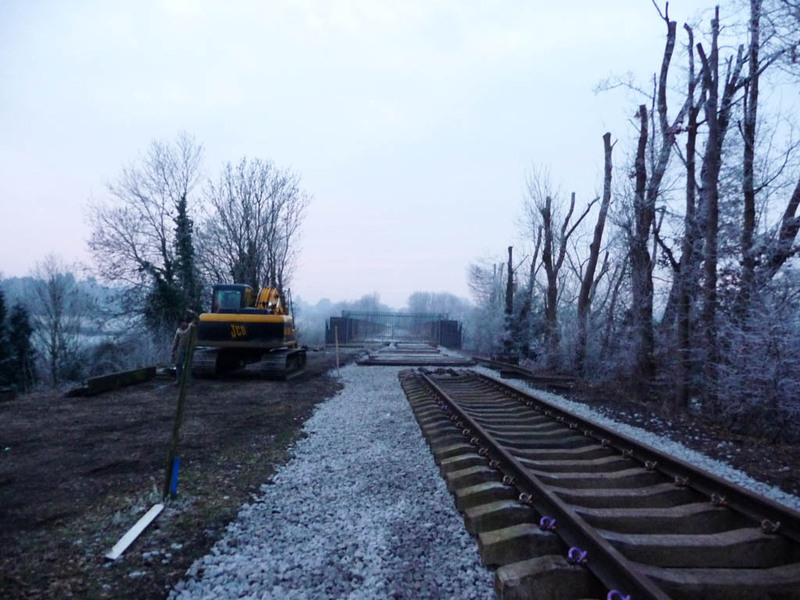 This week the track at Imberhorne has been re-laid to permit removal of any overspill during loading of the grampus wagons and extended under the bridge to facilitate removal of the last few tonnes of spoil. This photo is provided by Nigel Longdon. Some other photos, also taken last week, by Derek Hayward, are also available as part of his Kingscote to East Grinstead album. Behind the digger, with clay capping still protecting it until we can start digging again, is the remaining 90,000 tons of waste in the tip - if you can donate to the 50th Anniversary Appeal it will help us to complete the extension. The waste has to be taken away by road by contractors to another waste site, but we plan to deal with the capping material in much the same way as the intert spoil already removed, taking it out by rail. 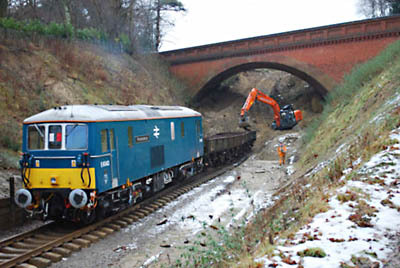 The excavation of the remaining spoil north of Imberhorne Lane bridge is now in hand and spoil trains recommenced on Friday 6th February, when five round trips ran using electro-diesel 73136 "Perseverance". It is hoped that this work will be complete by the end of March. 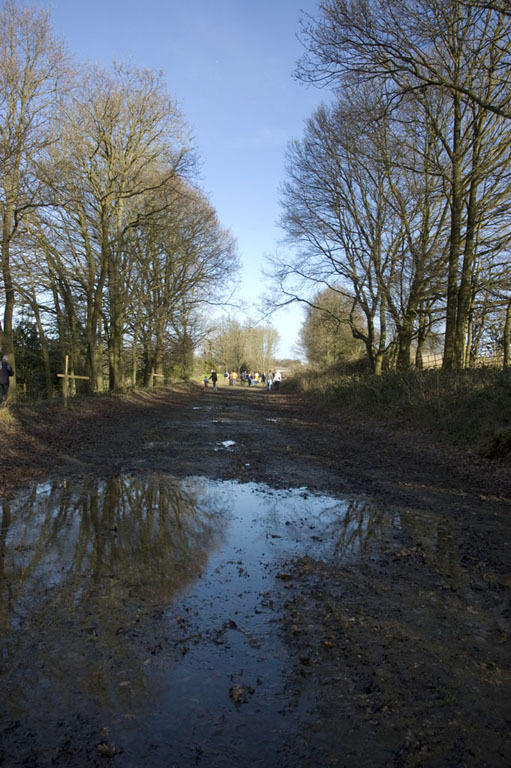 Photos are also available from Ian Purvis (Friday 6th Feb) and from Chris Dadson (Monday 9th and Tuesday 10th Feb). If you would like to help us, you can purchase "Tenner for the Tip" certificates - every £10 donated pays for the removal of a quarter of a ton of waste from the main part of the rubbish tip. You can also now buy a certificate through our on-line shop. 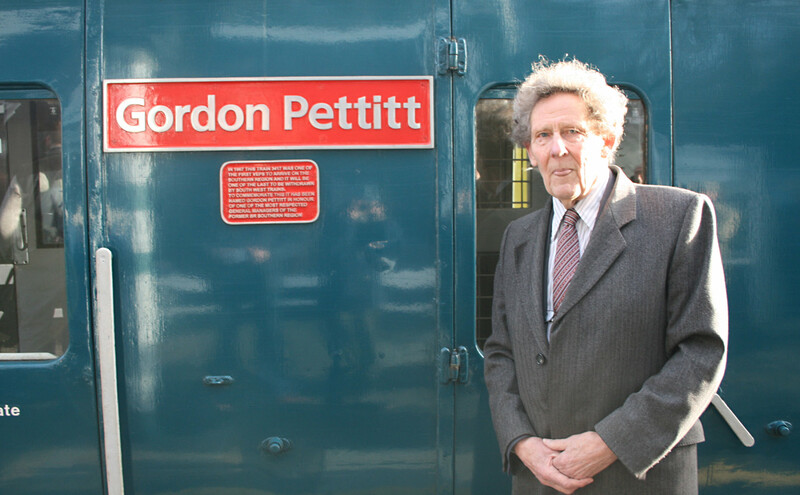 On Saturday 17th January we held a hugely successful Open Day at East Grinstead, including the arrival of 4 Vep unit 3417 "Gordon Pettitt". Tom Waghorn's photo on the right shows the hand-over ceremony for the unit, presented to the Bluebell by South West Trains. The speakers were Roy Watts (BPRS Chairman), Mac Macintosh (former Engineering Director SWT), Gordon Pettitt (former General Manager of the Southern Region of British Rail), Ginnie Waddingham (Mayor of East Grinstead), and Graham Flight (Chairman of Bluebell Railway PLC). 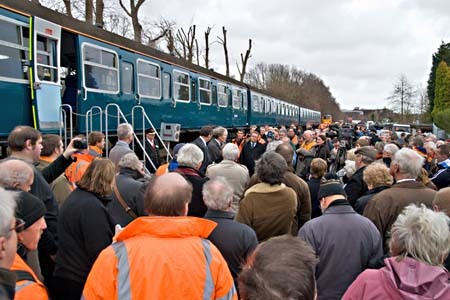 We had 730 visitors to the site, plus invited guests and those who arrived by the VEP, and also sold 114 "Tenner for the Tip" certificates. Don't forget the auction of the first Tenner for the Tip certificate which is still open. 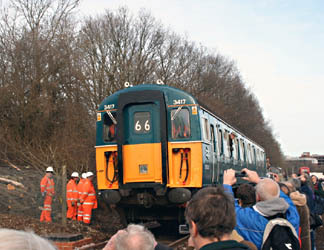 Full report on the day's events on the Southern Electric Group web site from Colin Duff. YouTube Video covering the journey from Woking to East Grinstead - Part 1 - Part 2 - Part 3, from Oliver Ashmole, ATV London. Derek Hayward has updated his photos of the Kingscote to East Grinstead section of his trackbed tour with photos taken during the open day and trackbed tour, and re-organised and updated the gallery. 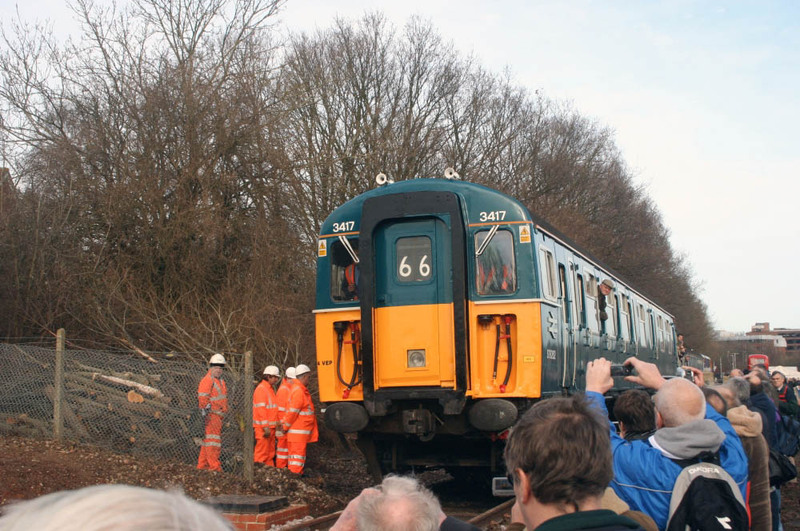 Although she was only delivered on Saturday, the railway now needs to honour its commitment to ensure that the 4 Vep is looked after. Following the hugely successful Open Day, the East Grinstead site has now reverted to a construction site and is therefore now inaccessible to people, thus isolating the unit. 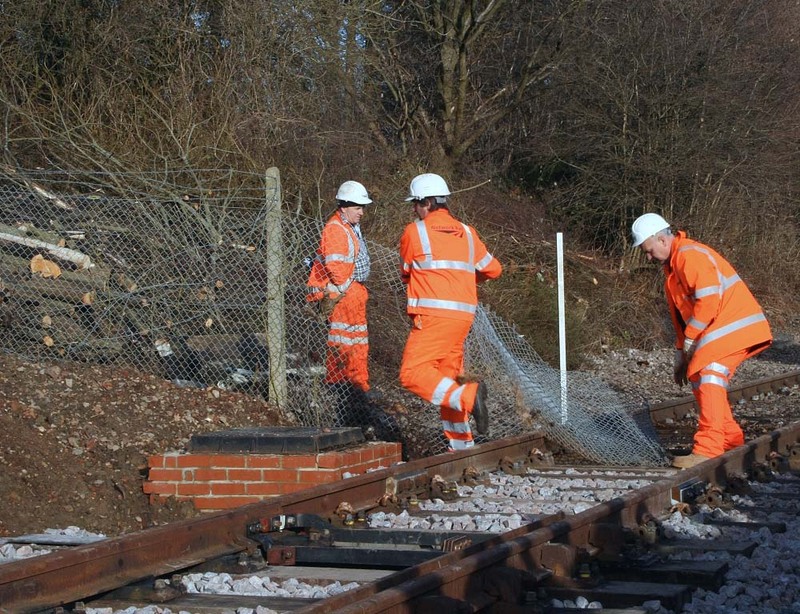 With construction works due to start at East Grinstead and the unit in an exposed position, the Bluebell Railway has accepted the offer of short term accommodation at Eastleigh railway works. 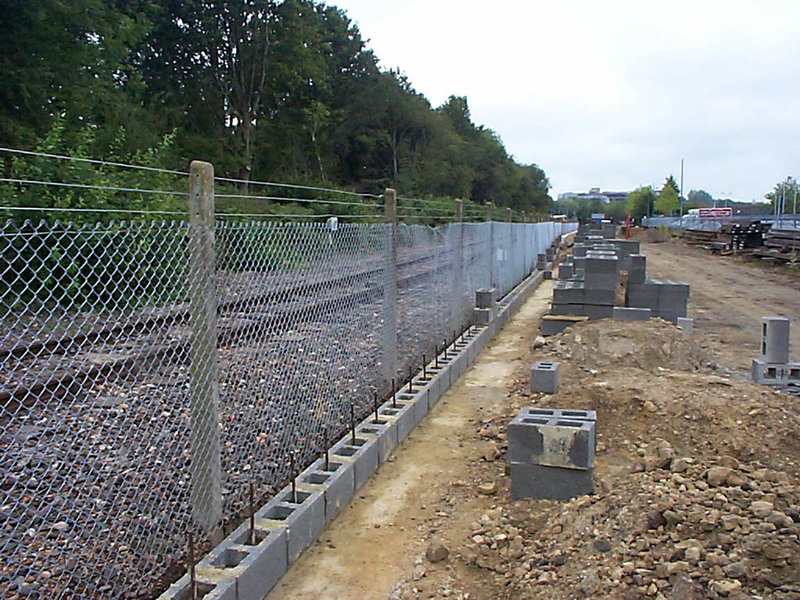 Knights Rail have generously sponsored the move to the works where she will be under cover and back on the 3rd Rail. She will receive care and attention whilst she is in the works and she will certainly, along with LSWR B4 No.96 " Normandy" be representing the Bluebell at the forthcoming Eastleigh 100 event in May. All this has happened very quickly (it left at 12.50 today in a special move organised at remarkably short notice) and we are grateful to everybody who has made this move possible; an excellent example of team work co-operation to ensure that the unit will be in a much safer store. 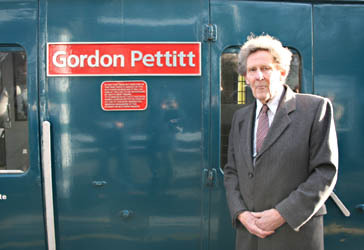 The unit remains in Bluebell ownership, and will of course return at an appropriate time later. 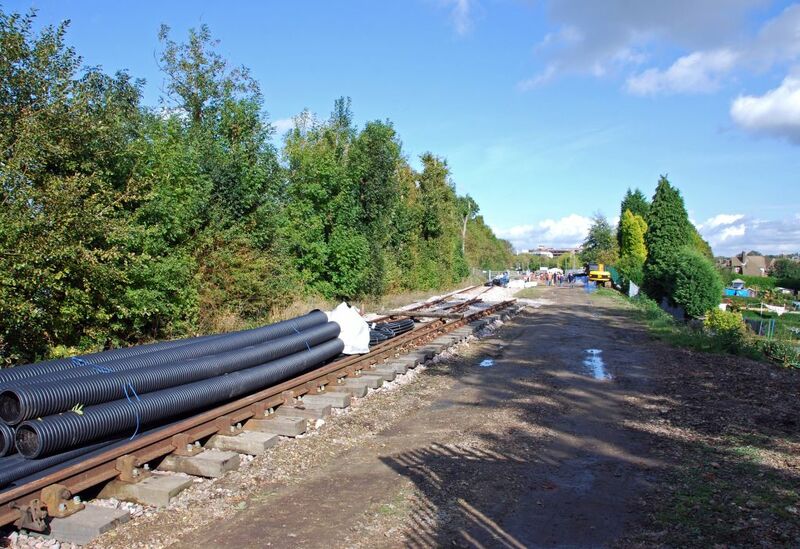 Main-line connection is made at East Grinstead! 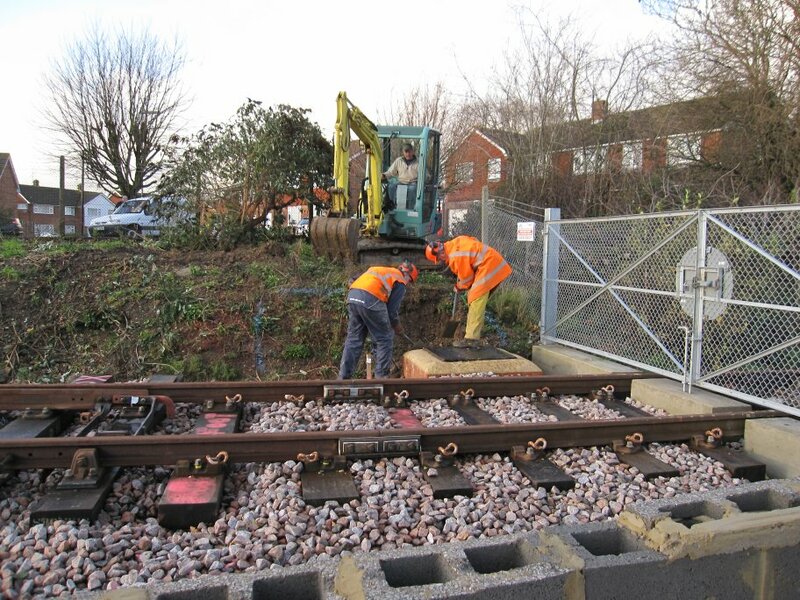 In overnight engineering work, Network Rail connected us to the main line at East Grinstead on Tuesday night. 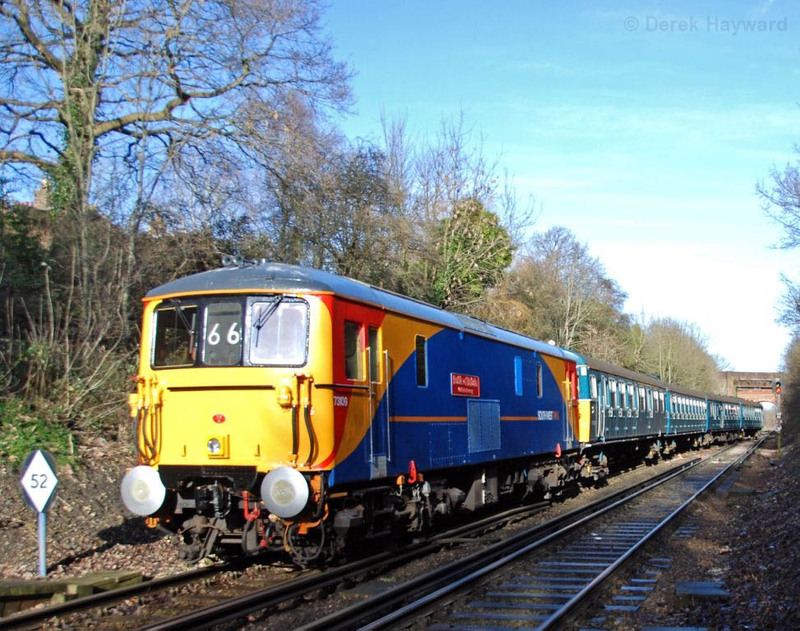 The Bluebell track at East Grinstead will only run as far as the viaduct for the present, and we are set to receive the 4 Vep unit on Saturday as part of our Open Day on the East Grinstead station site. David Chappell's photo on the left (taken on Thursday 15th) shows that, except for a little work to gauge, screw-down and ballast the last bit of track today, all was set for Saturday. 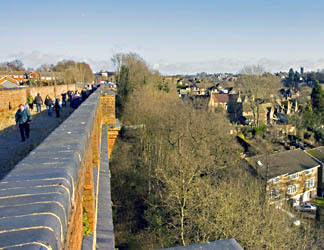 The photo was taken from the end of the viaduct looking northwards. 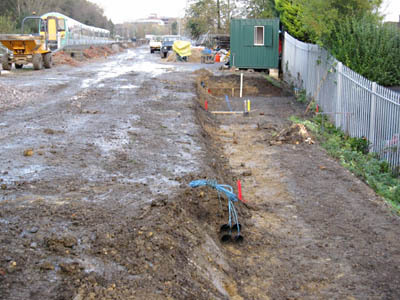 The track heading off to the right, where the digger is, will run into our new station platform, and that on the left is our main-line connection. 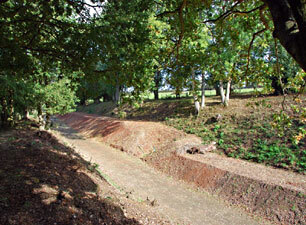 David's second photo below (taken today), shows our boundary with the main line. 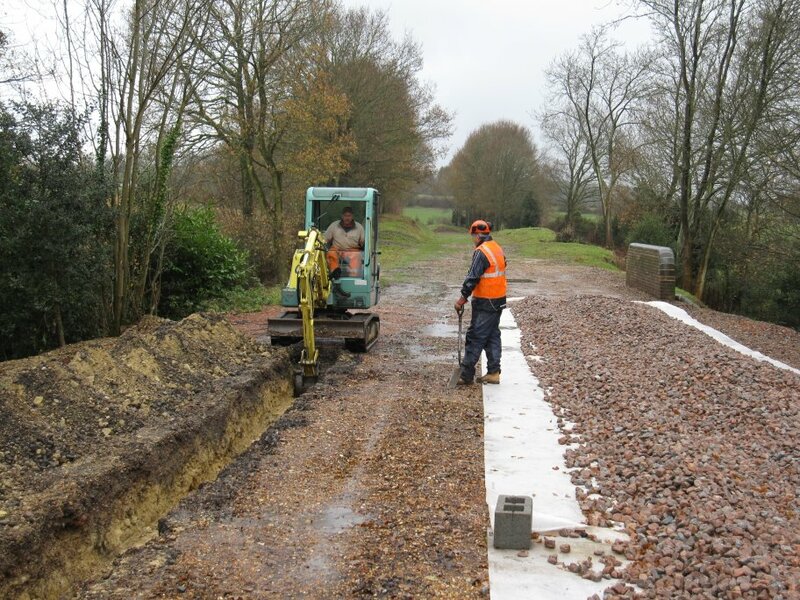 Phil Jemmison's photo shows that track-laying is under way at East Grinstead in preparation for the arrival of the 4 Vep next Saturday. 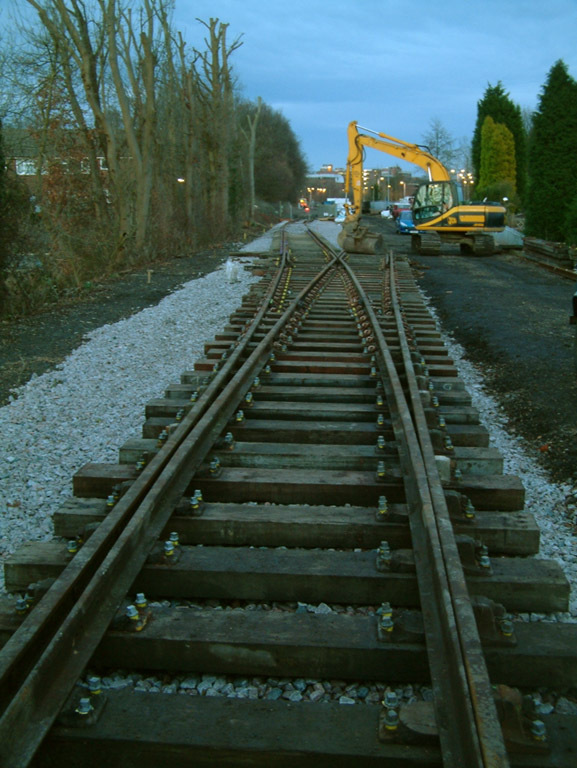 The track being laid is that which will form the connection to the main-line, including trap points and the main point which will form the connection between the Bluebell station and the running line over the viaduct in its normal position, and our main-line connection when reversed. The slewing of the actual connection to the main line has yet to be made, but work has progressed significantly since the photo to the left was taken on Thursday, as seen in Phil Jemmison's photo below (from Saturday). Page maintained by Richard Salmon with thanks to Nigel Longdon, Patrick Plane, Colin Duff, Derek Hayward, Tom Waghorn, Andrew Strongitharm, Martin Lawrence, Roy Watts, David Chappell, Phil Jemmison, Mike Hopps, David Middleton, Simon Smith and Chris White.